Jiang Shi-Liang, Zhou, Daxin, Cao Qi-Ling, Ge Shuping. 1. 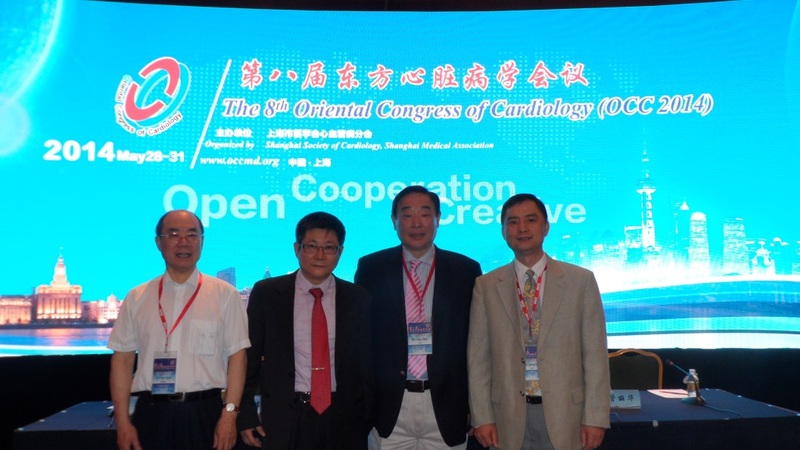 Many CAAC leaders and members were present in the 8th Oriental Congress of Cardiology from May 28 to 31, 2014 in Shanghai, China. 2. CAAC leaders and members who gave lectures and/or chaired plenary sessions or subspecialty forums include: Drs. Hong Wang, MD, PhD,(Co-President CAAC), Eugene Chen, MD, PhD (VP), Xinliang Ma (VP), Minghui Zou (Co-Chair, Leadership Group in Research), Gangjian Qin, Shuping Ge, MD, (Co-Chair, BOT), etc. 3. Dr. Shuping Ge also participated in the "Night of Huangpu River" hosted by Dr. Junbo Ge, MD, President of OCC. Members were present in the 8th Oriental Congress of Cardiology from May 28 to 31, 2014 in Shanghai, China. Dr.Eugene Chen: 血管外周组织在高血压和糖尿病病理中的作用：朋友或敌人？Perivascular Adipose Tissue in Vascular Health and Disease: Friend or Foe?